Having a reliable supply of electricity is essential for the operation of any firm. In most developing countries, however, electricity supply is highly unreliable. 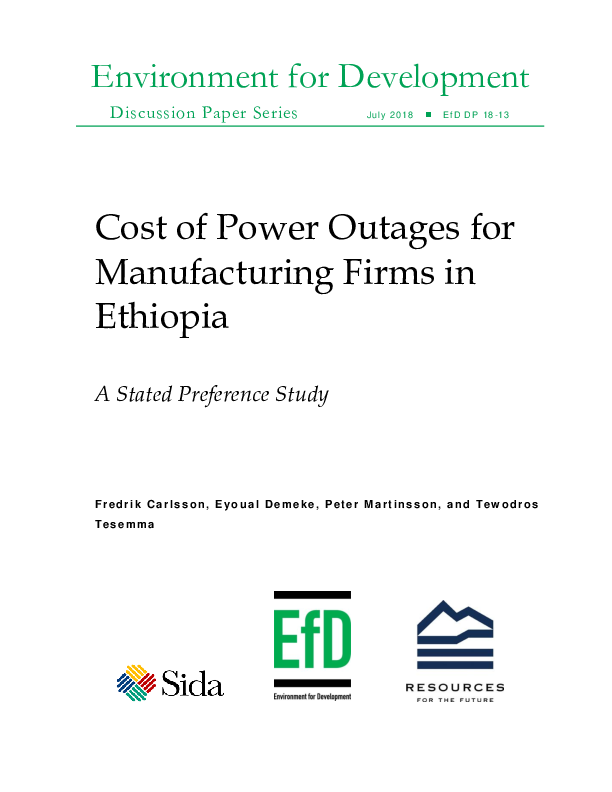 In this study, we estimate the cost of power outages for micro-, small-, and medium-sized enterprises in Addis Ababa, Ethiopia, using a stated preference survey. We find that the willingness to pay, and thus the cost of power outages, is substantial. The estimated willingness to pay for a reduction of one power outage corresponds to a tariff increase of 16 percent. The willingness to pay for reducing the average length of a power outage by one hour corresponds to a 33 percent increase. The compensating variation for a zero-outage situation corresponds to about three times the current electricity cost. There is, however, considerable heterogeneity in costs across sectors, firm sizes, and levels of electricity consumption. Policy makers could consider this observed heterogeneity when it comes to aspects such as where to invest to improve reliability and different types of electricity contracts.